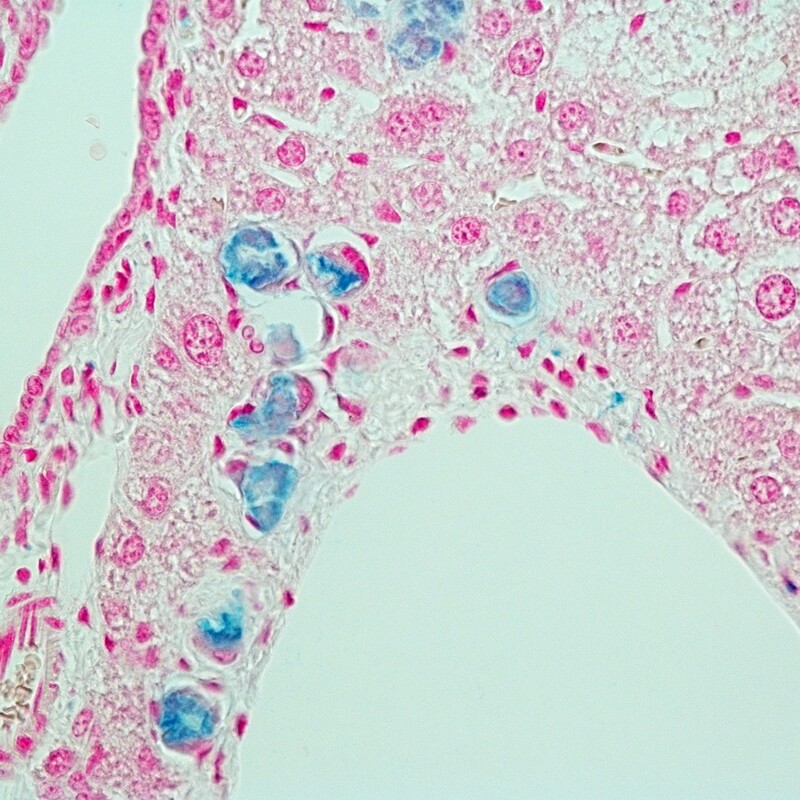 Prussian Blue Iron Stain Kit | Polysciences, Inc.
Photo: Mouse liver section stained with Prussian Blue Iron Stain Kit. Photographed by Holly M Poling of Cincinnati Children’s Hosp. Med. Center. Prussian Blue or Perls’ reaction is used to demonstrate ferric iron and ferritin. This is not a true staining technique rather, it is a histochemical reaction. The protein is split off by the hydrochloric acid, allowing the potassium ferrocyanide to combine with the ferric iron. This forms the ferric ferrocyanide or Prussian Blue. Fixation: 10% NBF or alcohol can be used. Sections should be cut at 4μ to 5μ or blood or bone marrow smears. Avilés MO, Mangual JO, Ebner AD, Ritter JA. (2008) Isolated swine heart ventricle perfusion model for implant assisted-magnetic drug targeting. Int J Pharm. 2008 361(1-2):202-8. Arbab AS, Bashaw, LA, Miller BR, Jordan EK, Lewis, BK, Kalish H, Frank JA Characterization of Biophysical and Metabolic Properties of Cells Labeled with Superparamagnetic Iron Oxide Nanoparticles and Transfection Agent for Cellular MR Imaging RSNA Radiology 2003 229(3).